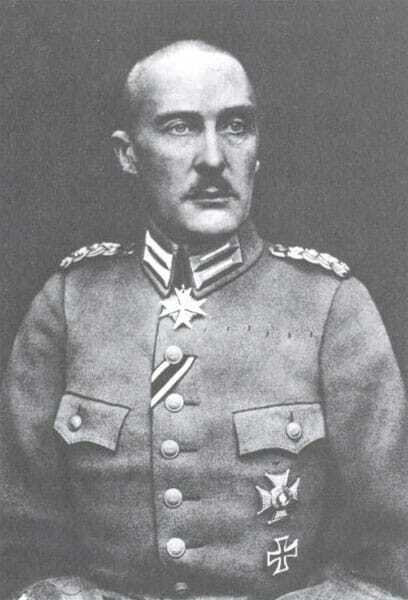 Duke Albrecht of Wurttemberg, a field-marshal of the German Enpire, is shown here displaying the Pour le Merite that he received on August 27, 1915. France: Prime Minister Briand proposes that ‘In order to ensure unity of command on the Western Front, the French General-In-Chief will from the 1 March 1917 have authority over the British Forces … in all that concerns … operations … dispositions … allotment of material and resources … to the Armies’. Haig and Robertson object (plan modified February 27). Somme: BEF 2nd Division and Anzac Corps fight for the Thilloys (until March 2) southwest of Bapaume. Flanders: General Sixt von Arnim takes over Fourth Army from Duke Albrecht of Wurttemberg who now commands his own Flanders Army Group; both in command for duration of war. Channel: 11 German destroyers (Tillessen) raid, (night February 25/26), Dover barrage including 10-minutes shelling of Margate and Broadstairs (4 civilian casualties). Eastern Atlantic – The ‘Overt Act’: Cunard liner Laconia sunk by U-boat off Fastnet (12 dead including 4 Americans). US President Wilson chooses to regard this latest outrage as conclusive proof of Imperial Germany’s perfidy and bad faith. Baltic Provinces: 100 Royal Navy Division PoWs arrive at Reiskatte Reprisal Camp (c.3 miles from Front) to dig trenches, often under Russian fire (until June 10); another 500 PoWs join them.